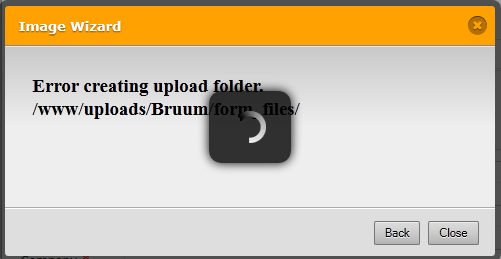 Am trying to upload a small logo - either *.png or *.jpg, via the Image Wizard, and get the error attached every time. Are you able to help? Sorry for the inconvenience. If you don't mind could you please post here what browsers you are using and its version? If you are still having trouble with the uploads please send us your file and we will upload it for you. Have tried in IE 9 and latest Firefox - same result. How can I get image to you so you can put up for me? You may try uploading here, and then send me the image directlink. We'll wait for your response. I tried recreating the problem you described using IE9, Firefox, and Chrome, but failed to do so. I was able to upload that logo to both of your forms. Of course, I deleted it because I am not sure in which form you are trying to insert the logo. Can you please try uploading again? If the problem still persists, kindly clear your browser's cache. Press Alt, Ctrl, and Delete keys all at once. Kindly inform us if you're still having issues despite doing the solution I suggested. Thanks! Have just tried again from my laptop at home using IE9 and worked fine. Please note though that the 2nd form you referred to is not mine - I didn't create it. The only form we have is the newsletter subscribe giveaway. Can I delete the contact me one? Not sure where that has come from this afternoon. Glad to hear it is working fine now. Your account may have been affected by one of those hiccups that happen every now and then. That may be the reason why a form created on May 17 is in your account which you just registered yesterday. You can be assured though that if this is a problem that recurs very often, we'll have our developers investigate and fix the cause. For now, we advise you to observe. Notify us immediately if there's any problem with your account. Thanks!